Armed Forces of the United State of America. The memorial is located on the grounds of the Harris Town Hall and Recreation Center and is accessible from eastbound Polk Street / County Road J / County Road B, just east of its intersection with County Road B, at or near W4969 County Road J, Harrisville, Wisconsin 53964. The memorial, visible to the left, is located adjacent to the Town Hall. So confusing, and annoyingly typical for Wisconsin small towns. The Harrisville Bratfest is held at this location. The event, touted as the 'LARGEST One Day Brat Fest in the State' is held the Sunday of Labor Day Weekend. Activities include midway rides, antique tractor pull, truck pull, modified tractor pull, softball & volleyball, food, and live music. Oh, and tons of brats and beer! Could not get any more Wisconsin than this! I've not seen a business collage like this anywhere else in Wisconsin! 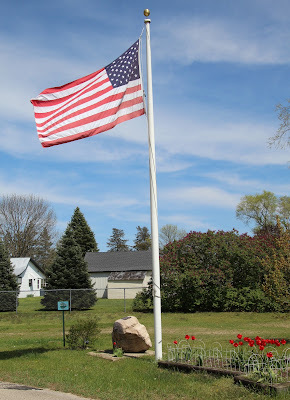 The memorial is located in Harrisville, Wisconsin. Going today, we will get some pics for you. Have a wonderful time! Will look forward to the photos.